Currently listening to Eddie Vedder - Into The Wild.Check it out.In case you don’t know, it’s the soundtrack for the movie Into The Wild. 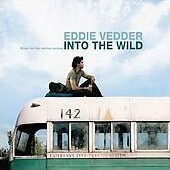 Currently listening to Eddie Vedder - Into The Wild. In case you don’t know, it’s the soundtrack for the movie Into The Wild.